The engineers at San Jamar understand that whether you serve made-to-order meals during the lunch hour rush or offer gourmet pizzas all night long, thorough and effective food safety processes are a cornerstone of any successful foodservice operation. In addition to identifying and eliminating potential hazards with a HACCP plan, operators can protect their customers by using tools and equipment that are designed with food safety in mind, like the Sani Station. This guide provides more information about the kit, how it simplifies the cleaning process for prep and serving utensils, and how it can benefit sandwich shops, pizzerias, and other foodservice operations. 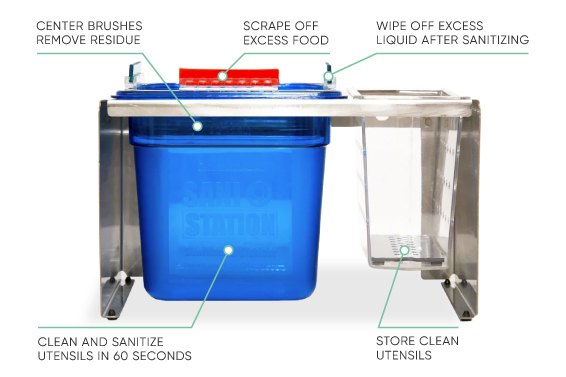 The Sani Station, which is comprised of two containers, creates a place for cooks and servers to quickly clean and sanitize knives, pizza cutters, tongs, spoons, and other serving utensils between uses, and then store them until they are used again. The large container is filled with water and a cleaning/sanitizing chemical, creating a solution that can sanitize utensils in 60 seconds. It has a red squeegee on the front for scraping off excess food, center brushes that remove residue and hold utensils during the sanitization process, and a green squeegee on each side for wiping off excess liquid after the utensil has been sanitized. When utensils are removed from the cleaning/sanitizing container, they should be placed in the smaller container to air dry. It has rows of holes on the left and right sides so air can circulate around the utensils placed there, ensuring they're allowed to fully dry. This container also provides a sanitary space for utensils to be stored until they are used again. The San Jamar Sani Station is available as a counter stand unit (which can also be installed as a wall-mounted unit), a vertically mounted unit, and a vertically hanging unit. The counter stand units come in three sizes to accommodate utensils measuring 5, 9, or 12 inches long, while the vertically mounted and hanging units can be used with utensils measuring 71⁄2 inches long. In order to ensure the created solution properly sanitizes utensils, the Sani Station kit includes chlorine test strips and pre-portioned packets of sanitizer. The chemical used in this mixture has been carefully balanced to provide the correct amount of dilution and sanitization and carries NSF D21 approval as a food-safe antimicrobial agent that does not require additional rinsing. The cleaner and sanitizer provided should only be used with Sani Stations, and other cleaners and sanitizers should not be substituted for the provided packs. Simplify your utensil cleaning process. The Sani Station provides an all-in-one solution for cleaning, sanitizing, and storing utensils without employees having to leave their stations, making the process easier and faster, since sanitization takes only 60 seconds. Easily store utensils between uses. Instead of being left on prep spaces or dirty countertops, knives can be conveniently stored in the Sani Station's sanitary air-drying container. Implement an effective food safety process. By thoroughly cleaning utensils and providing a place for them to dry and be stored handle up, this device helps prevent cross-contamination as well as the growth and spread of bacteria that causes foodborne illnesses, including E. coli and Salmonella. Conserve utilities. The Sani Station does not require plumbing or electricity, and utensils do not need to be rinsed after they are removed from the cleaning and sanitizing solution. Clean utensils virtually anywhere. Whether you require a countertop unit, a wall-mounted unit, or one that hangs from your prep table, the Sani Station is available in several designs to ensure every operator is able to find a utensil-cleaning solution that suits their workflow. Table I. Category Codes - Proprietary Substances. NSF. Accessed March 2019.